"Perfection comes from our experience, dedication & passion to create an event which is remembered long after it is over." The Tulip Touch is a youthful, creative and dynamic team. We specialise in truly unique and bespoke designer events focusing on style, success and the wow-factor. At Tulip Touch we concentrate on the finer details that will make your event different. Our team is up to date with latest designs and entertainment, We have better food & hospitality staff than what the ‘event world’ has to offer. We make sure we stay one step ahead of the game so we can offer all that is new and exciting. We set exceptionally high standards & ensure that our vendors live up to it too.  Based in Gujarat(India) Tulip Touch can, and does, coordinate most events you would care to imagine. Copyright © 2015 The Tulip Touch Pvt. Ltd.